While World War II movies bring to mind a host of settings from tense submarine cat-and-mouse battles in the Pacific to stiff-upper-lip homefront movies in the UK, a single dominant motif comes to mind when thinking of World War I on the screen: trenches. That's partly due to my own ignorance as I have largely missed out on the grand tradition of World War I pilot movies,including the first Best Picture winner “Wings” (1927). But from “All Quiet on the Western Front” to “Paths of Glory” and even “Blackadder Goes Forth,” the most enduring image of the Great War is of men huddled in muddy, makeshift trenches, awaiting the order to go over the top, knowing all the while it probably means not coming back. 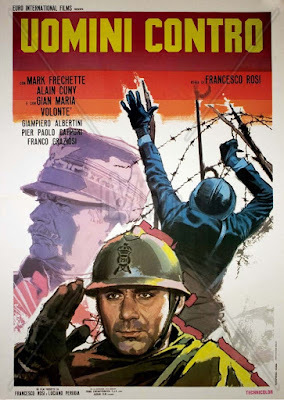 Francesco Rosi continued this tradition with “Many Wars Ago” (1970 – AKA “Uomini Contro”), a film adapted from the slightly fictionalized memoir “A Year on the Plateau” by Italian officer Emilio Lussu. The film recasts Lussu as Lt. Sassu (American actor Mark Frechette, fresh of his breakout role in “Zabriskie Point” and a few years before his arrest for bank robbery and subsequent death in prison) and transforms the book's first-person account into an third-person narrative with Sassu only gradually assuming a more prominent role. Italian soldiers stationed on the Asiago Plateau in the north of the country hunker down in trenches less than a half a mile from Austrian soldiers heavily fortified atop a hill. On an early maneuver, an Italian scout calls for a halt when enfilading fire strafes the ranks. The unauthorized stop enrages General Leone (French star Alain Cuny) who, while stationed strategically towards the rear of the advance, orders the scout to be immediately executed. The troops are understandably distraught, and the film traces the open rebellion of Lt. Ottolenghi (Gian Maria Volonté), a committed socialist, and the gradual awakening he induces in the more by-the-numbers Lt. Sassu. The soldiers initially view the Great War as another natural plague to be endured, but become increasingly convinced that they are the victims of a class war. As the dissension mounts the film builds to a critical decision point: will the troops spin right around and attack the real enemy back at headquarters? As you might expect, “Many Wars Ago” paints a drab portrait all in green, gray, and brown with the occasional flourish of red. Rosi balances scenes of sodden inertia in the trenches with chaotically choreographed battles sometimes as difficult to make sense of as it must be for the ground-level participants to experience. Some images are difficult to shake, like the almost Python-esque spectacle of men outfitted in medieval armor and sent right into the line of modern machine gun fire. 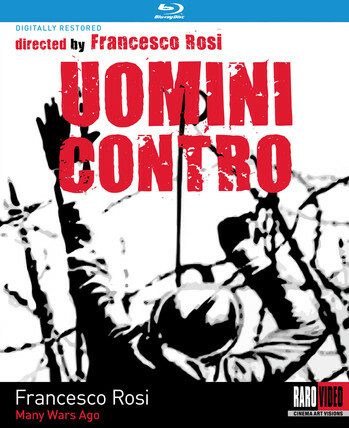 Rosi's bleak depiction of war sparked controversy from many quarters when it debuted at Venice in 1970. The right predictably fumed about the movie's alleged defamation of the military while some on the left weren't satisfied that the film appropriately portrayed the righteousness of the class struggle. Rosi doesn't conflate courage or conviction with success, and provides no promise that the martyred victims will inspire a new generation to fight the good fight. Maybe he read a history book or two, and learned that sometimes the hero's journey just ends. The film is presented in its original 1.33:1 aspect ratio. According to the packaging, the movie has been “digitally restored in collaboration with the National Cinematheque and the Turin National Film Museum under the supervision of Francesco Rosi.” Another note slightly complicates the matter. This somewhat unusual note suggests that the film could use another level of restoration, but the high-def transfer we get looks fairly strong to me. The note makes me wonder whether the drab colors are entirely faithful to Rosi's original vision, but they seem appropriate to a film about trench warfare. Some modest damage is visible in a few scenes, mostly a few flecks and speckles, but nothing significant. An even better version might await, but Kino and Raro Video have provided a solid transfer here. The DTS-HD Master 2.0 track isn't particularly dynamic, and dubbing in Italian movies of this era always sounds weird, like it's coming from a disembodied source, but that's not a flaw in the mix. No distortion is noticeable and the sometimes overwhelming score by Piero Picconi sounds surprisingly resonant. Optional English subtitles support the Italian audio. This Kino/Raro Video release includes a recent interview with director Francesco Rosi (28 min.) and a brief piece (2 min.) about the film's restoration. The latter is somewhat odd as a few of the side-by-side before and after examples don't show evidence of significant change. You can also access a PDF of the Original Screenplay by Tonino Guerra, Raffaele La Capria, and Francesco Rosi. Raro Video has also included a nifty 20-page insert booklet with many short essays from various sources, including a note from Rosi as well as essays and reviews from critics. Many of them are translated from Italian with occasionally awkward grammar, but the diversity of material cited here provides a strong sampling of opinion about this controversial and somewhat overlooked film. 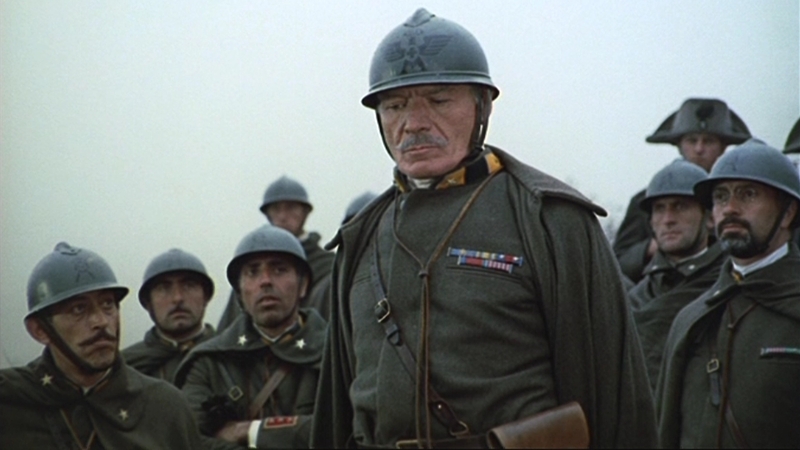 I imagine Rosi and some of the film's boosters get tired of comparisons to “Paths of Glory,” but they are apt. While “Paths of Glory” is a difficult film to match, Rosi's movie was a riskier proposition as he was critiquing his own country's military history; Kubrick wasn't chancing as much by tackling a sordid episode in the history of the French army. “Many Wars Ago” deserves a more prominent place in discussions of World War I cinema, and this Blu-ray should help stir the conversation.